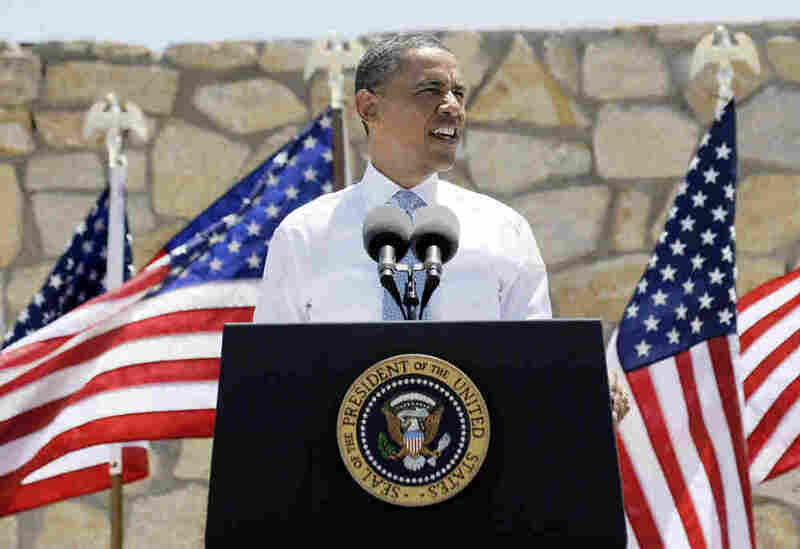 Obama Makes Economic Case For Immigration : It's All Politics In his El Paso, Tex. speech Tuesday, the president had to explain why legalizing millions of illegal immigrants wouldn't hurt Americans economically. He argued that illegal immigrants force down U.S. wages since workers lacking legal status can be more readily exploited by unethical employers. President Obama makes an economic case for immigration reform at the Chamizal National Memorial on Tuesday in El Paso, Texas. President Obama realizes he has a problem on the immigration front. Actually, he has a few problems. But one of the gnarliest is that the notion of providing millions of illegal immigrants with a path to legalization raises the economic anxiety of millions of Americans. Even before the housing bubble burst in 2007, overhauling immigration was a heavy lift. That's even more true now with Americans much more worried about jobs than they were the last time Congress and a president, then George W. Bush, tried to achieve comprehensive immigration reform. So in his speech in El Paso, Tex. Tuesday along the U.S.-Mexico border, the president had to find a way to explain why legalizing millions of illegal immigrants wouldn't hurt Americans economically. His argument was that it's the illegal nature of these immigrants that forces down U.S. wages since workers lacking legal status can be more readily exploited by unethical employers. Think about it. Over the past decade, even before the recession hit, middle-class families were struggling to get by as the costs went up for everything, from health care, to college tuition, to groceries, to gas. Their incomes didn't go up with those prices. We're seeing it again right now with gas prices. But then our laws discourage them from using those skills to start a business or a new industry here in the United States. Instead of training entrepreneurs to stay here, we train them to create jobs for our competition. That makes no sense. In a global marketplace, we need all the talent we can attract, all the talent we can get to stay here to start businesses — not just to benefit those individuals, but because their contribution will benefit all Americans. So we don't want the next Intel or the next Google to be created in China or India. We want those companies and jobs to take root here. (Applause.) Bill Gates gets this. He knows a little something about the high-tech industry. He said, "The United States will find it far more difficult to maintain its competitive edge if it excludes those who are able and willing to help us compete." So immigration is not just the right thing to do. It's smart for our economy. Not that the president didn't make the moral argument, for instance, that it doesn't square with American values to break up families through deportation. Or to punish young people who were brought into the U.S. as children illegally by their parents. But he clearly was aware that if he was to make any progress with the American people on an immigration overhaul, to get more voters to see it his way, he needed to make a strong appeal that it's in their economic interest to fix the current system. As I wrote earlier, immigration reform is a political no-brainer for the president and congressional Democrats since it energizes the fastest growing segment of the U.S. population. That demographic just so happens to be an important part of the Democratic base. It also puts congressional Republicans and GOP presidential hopefuls in a tricky spot since their party's base has proportionally more immigration hardliners than the Democratic Party. That made the speech, an official presidential event, arguably something of a campaign event too. And the president gave the event a campaign feel by telling his audience if they agreed with his approach on immigration reform, they should contact WhiteHouse.gov. Campaigns often use such techniques to collect email addresses. While it's good politics for Democrats to make the strongest appeal possible to Latinos, the president suggested that some Republicans saw it as good politics to focus strictly on border enforcement to the exclusion of everything else, including figuring out how to normalize the 11 million illegal immigrants. OBAMA: ... The Border Patrol has 20,000 agents — more than twice as many as there were in 2004. It's a build-up that began under President Bush and that we've continued, and I had a chance to meet some of these outstanding agents, and actually saw some of them on horseback who looked pretty tough. (Laughter.) So we put the agents here. So, here's the point. I want everybody to listen carefully to this. We have gone above and beyond what was requested by the very Republicans who said they supported broader reform as long as we got serious about enforcement. All the stuff they asked for, we've done. But even though we've answered these concerns, I've got to say I suspect there are still going to be some who are trying to move the goal posts on us one more time. THE PRESIDENT: You know, they said we needed to triple the Border Patrol. Or now they're going to say we need to quadruple the Border Patrol. Or they'll want a higher fence. Maybe they'll need a moat. (Laughter.) Maybe they want alligators in the moat. (Laughter.) They'll never be satisfied. And I understand that. That's politics. As for Obama's outline for reform, it's essentially what Senate Democrats and Republicans came up with when Obama was in the Senate. Illegal immigrants would have to pay their taxes and a fine for breaking the law, learn English and undergo a background check before they would be allowed to remain in the U.S. legally. Hardliners will immediately dismiss this as amnesty. Meanwhile, the system would be overhauled to make it easier for immigrants, especially highly skilled ones sought by Silicon Valley high-tech firms and other employers, to enter and remain in the U.S.
We may be four years or so on from the last time all these kinds of ideas were proposed but the results are likely to be the same as then, that is, not much is likely to change, at least not before 2012.